Subject: Photo missing from SEC 7 file. I resend this data after seeing that it is not in my sent box yet it was yesterday as I sent it just before my allotted time expired. You may not have received it. To Data Controller and PS Lancs police. I have received a copy letter that you sent dated 3 July 2018 to a campaigner Mr J Graham. he had tried to obtain for me the copies of the photos you produced to show to DALTON in 45 Fell View mid-Aug 2016, the photos were of MY car X165 YUB at Manchester airport on 5 Oct 2015 with Bleasdale’s car red Audi WG03 DMW in photo and Travis Dalton with pregnant teenager (not sure where she lives) of 6 months apparently, and Mrs M Dalton aka Mrs Wheatfield. Bleasdale had dropped them off at the airport for their Tenerife holiday which minus passports, flights, knowledge of Tenerife at all, where they stayed, when they returned, how they returned, travel docs, holiday photos and so forth seems to be odd at least. Personally I think you and they are all liars. You showed Dalton the photos end Aug 2016 as he relayed to me when you sent him to a) provoke me, b) try and get my sympathy vote, c) try to have me recruit him to call on all lowlife to cease harassing me where it was to be said that he aided and abetted me to harass the thieves fraudsters and bullying lowlife who 24 at least have me living in their houses with them (apparently). 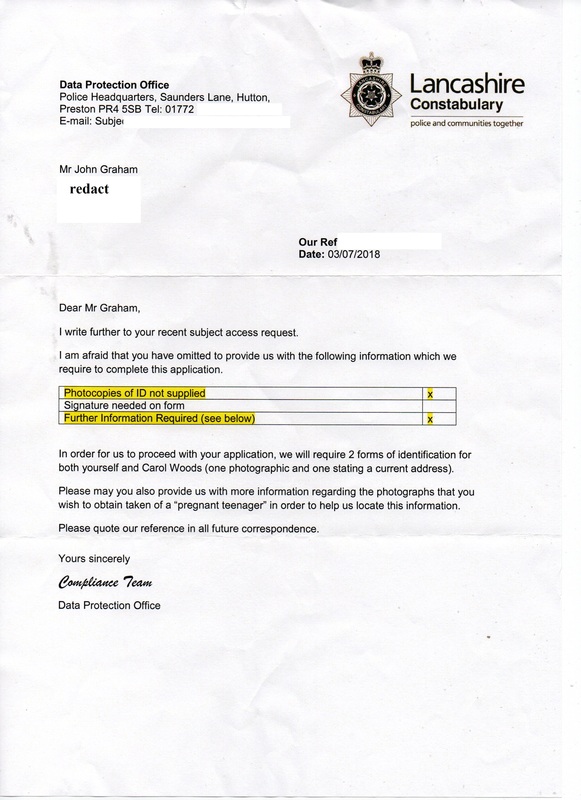 You, via 3/7/18, ask Mr Graham for photos for ID and from me which is disingenuous as you had my photo ID in Sept 2016 plus £10 and which said photos of 2015 should have been included on the Sec 7 SAR file sent to me after the ICO “persuaded you” to adhere to the law. You want the photos to try and add them to the thuggery of 31 Jan 2018 when you arrested me for harassing Mr KINGSLEY WILLIAMS who I know as MR CARL WOODS* of 30 Fell View LA2 9RP and you arrested me for being the male from Bournemouth! That failing in the INTENTION in use of NHS, and you did not at all even speak to Mr JG; he wrote an affidavit stating he was himself and his web page was his and had been for many years. You had a duty to inform me that you had that and thus I was not him yet you did nothing EXCEPT to try and link the DALTON halfwit hiding in Lancaster police station cells on 31 Jan 2018 with ME to account for his E-CRIME FOUND OUT and the use of R48 GMA etc. *Any time I refer to the fraudster and thief in 30 Fell View as Carl you send the yob from Ryelands to stand about by my car and pretend he is MR CARL WOODS. Today I am miles away and look forward to seeing him walk all this way from Ryelands. Maybe you could get a taxi for him as you often arrange and pay for taxis to ferry about scum, what about using the helicopter as you did again recruit the air ambulance last night to aid and abet Jackson in 26 Fell View? The toy helicopter I left for BAYLY in 2012 to play with when he felt the urge to send out at vast expense the helicopter to harass and claim something FICTIONAL was FACT is not going to be rewritten; you have not used that toy and have not saved the tax-payer anything, you’re getting nothing else. The toy was air ambulance as that was all I could find. I will be sending a list of much else missing from my Sec 7 SAR file. Carol Woods Ms sorry I have no phone and whatever the overweight BT blob was intending outside this library, I took a photo, he is not linking me to anyone of yours. Sirs, I have been sent a copy of a letter that a campaigner received after writing to as if you would provide the photo that YOU CLAIM EXISTS of the pregnant teeenager, said to be TRAVIS DALTON’s girlfriend, 6 months pregnant on 5 Oct 2015 at Manchester airport with Dalton, his mother and WILLIAM BLEASEDALE in his car red Audi WG03 DMW. The girl, for those who will see this was still 6 months pregnant at end of Aug 2016!! 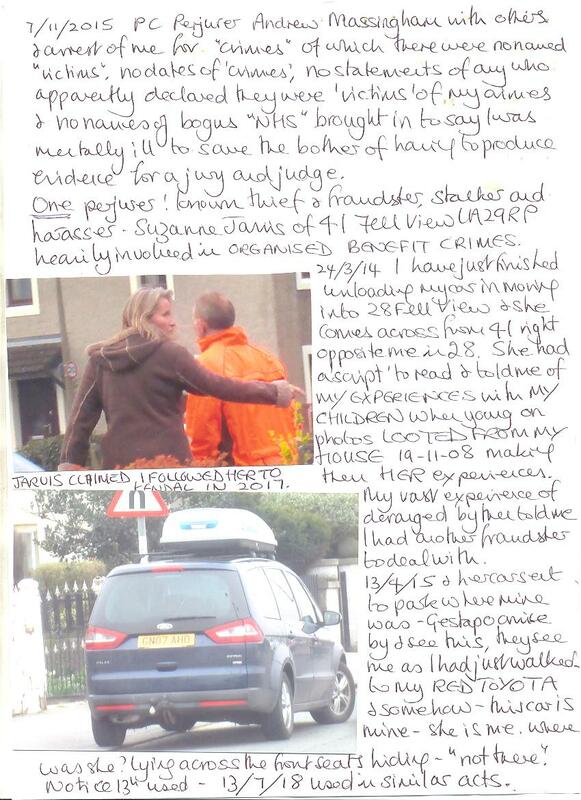 That was AFTER you had been to 45 Fell View the house of DALTON (I have no idea where the teenager lives) and shown them PHOTOS of MY CAR at manchester airport on 5 oct 2015 when they were going to Tenerife without a passport between them, a flight, any documents, knowing where the were staying, knowing when they were returning or even how they returned, without one single photo of holiday etc. I have asked for the photos of MY car YOU showed Dalton to send him trying to provoke and entrap me end Aug 2016 (he wanted me to recruit him to deal with the scum that floats as a trap where you were all gouing to scream that I CONSPIRED TO HARM in the usual masonic lunacy of REVERSING FACT TO MAKE FICTION), that was what the campainger asked you for on my behalf. You replied with a disingenuous response saying he had to send 2 forms of ID as I did which I know you intended to use to be mixed up with the lunacy of 31 Jan 2018 when I was arrested for harassing the pervert, thief and fraudster MR CARL WOODS aka MR KINGSLEY WILLIAMS in 30 Fell View when he knew nothing about any supposed matter at all (which I fouind out about only in last few days) and arrested as being the campaigner MR J Graham. You had ID from me and £10 in 2016 and the photos should have been on my files for my Sec 7 SAR made as YOU claim they were rfom 5 Oct 2015. Why were they not on my file? Because you’re a bunch of liars and made those photos from my airport visit JULY 2016 which was so convenient to pop round to 45 and show them in Aug 2016. 1] the “Lancs. police custody records” connected to the arrest of Ms. Woods on 31 January 2018. These records are being witheld from being sent to Ms. Woods, which is contrary to current laws and statutes in place. 3] all photographs of Ms. Woods motor vehicle – a red saloon “Toyota Yaris” vehicle, reg. no. 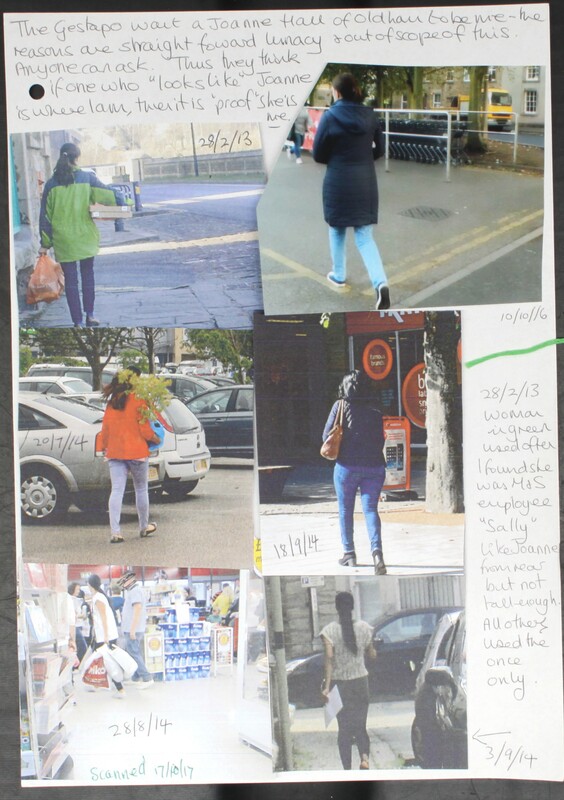 X165 Y4B – the photographs taken at Manchester Airport on the 5th October 2015.
c] all photographs taken of a “pregnant teenager”, resident at the time, or still resident at no. 2 Hall Drive, Caton, this subject being in a red Audi, registration no. WG03 DMW, at the location of Bleasdale, Lancashire. Further details pertaining to all the above subjects are shown in Ms. Woods “letter of permission” sent to myself, which is enclosed with this letter. Please forward the required information as soon as possible to myself at my Bournemouth address, shown at the top of this message. Subject: HOUSE THEFT IN BLACK and WHITE. Lancs. The person also wonders about why I send scanned documents showing events of 10 years ago. This is why. I am Carol Woods Ms and sorry I have no phone whatever Lancs Gestapo manufacture. Lancashire Gestapo do NOTHING new in my case, they rewrite history constantly which is why nothing changes and we do the “same old same old” merry go round except for me it is not so merry. The bullying, harassment, thuggery, treason, thefts and frauds with persons (plural) all claiming to be me FOR GAIN where I rent now 28 Fell View LA2 9RP continues but if I moved tomorrow, OTHERS would simply take their places and the merry go round goes round. WHY ARE THEY GETTING AWAY WITH BENEFIT FRAUD, BLUE BADGE FRAUD, SERIOUS ORGANISED CRIME, PERJURY (which perjury and bogus witnesses is always to claim I am seen committing offences) and the rest? How have those in earlier addresses got away with it? If I moved they would all sigh with relief and count their ill-gotten gains knowing there is no one seemingly able or with enough integrity to do anything at all. They would all have gained IN FRAUD and more. The person commenting that some of my documents are 10 years old hits the nail on the head without realising it. Last year they were 9 years old, the year before 8 and so on. 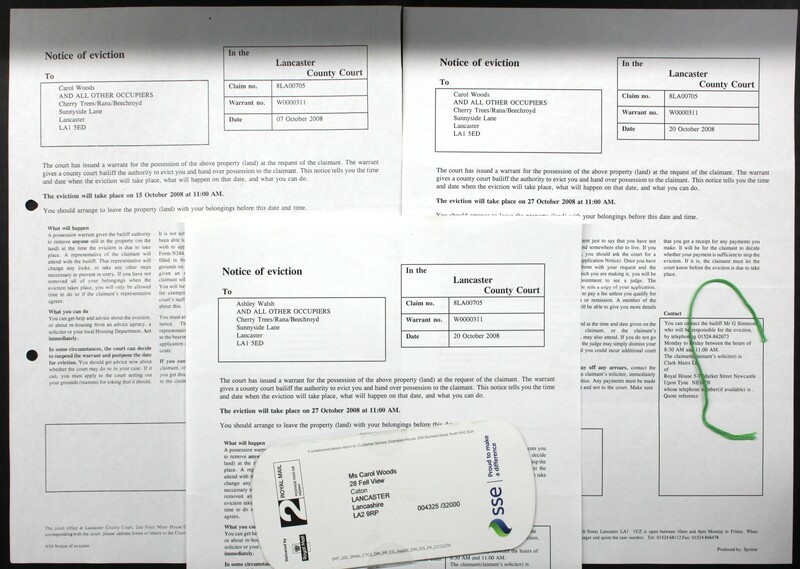 I attach NOTICES OF EVICTION OF ME FROM MY HOUSE FOR RENT ARREARS IN OCT 2008. RENT ARREARS? Yes apparently I had sold my house in May 2008 to POLICE OFFICER ANDREW HALLIDAY and forgot, I had agreed to pay him rent to stay in my house (people would wonder why I was still there after May 2008 if I had sold it) and forgot I had sold it so forgot to pay the rent. (I cannot be given his rank and badge number and his name is not on my title deeds safe with me so one wonders). Thus this JUNK issued to me and to a daughter of mine WHO NEVER LIVED IN MY HOUSE ANYWAY is to EVICT ME (and her) FOR RENT ARREARS. These are apparently court documents. And this was 10 years ago and why yet again, the thugs and old doxies collect, corrupt estate agents as you have all seen on photos who ALL pretend I have “met with them” NOW about MY house, and that has happened each year since the THEFT WRECKING and LOOTING of MY house in Lancaster which I was not going to be threatened into “forgetting” which is what happened. Thus 2008 the lunatics claim is NOW, 2018 EVERY YEAR is the NOW of my case, and the events are being acted out daily using lowlife yet again. This morning at 8 40am for example and the council using WILLIAMS in 30 Fell View who are used to be me, did call and start to open and slam their rear door and shout about FIXING DOORS because the COUNCIL added a STEEL DOOR to MY PRIVATE DWELLING HOUSE after ORBIS removed theirs and their equipment after finding they had been duped in Oct 08. How were they duped? Apparently I had been in Liverpool Magistrates Court on 23 Oct 2008 and whatever happened the judge instructed ORBIS in St HELEN’s to seize my house in which it was also TOTALLY wrecked. The CRIMINAL CASES REVIEW COMMISSION making enquiries to the court of the date supplied by me when I found out all that had gone on, told me that the court had no record of any such case yet I have the MoJ docs to show it did and which judge presided, not only that I have the police tapes of the person posing as me interviewed for the serious crime involved, harassment. The person interviewed as me is POLICE OFFICER TRACEY KENNEDY who NOW LIVES IN MY HOUSE and has done from April 2009. There is no “sale” on record of Halliday selling it to her yet I was evicted as he owned it in Oct 2008 and I had not paid him rent. ORBIS steel door on my front doorway after the thugs smashed their way in through my front door and then smashing my rear door was why the council thug and Williams acted their farce this morning as in this, the Gestapo try to give those they claim are me, my experiences to make them me!! There was nothing wrong with the doors at 30 Fell View and the council ran away when I opened and slammed my doors to see if my doors were faulty. They were not; I saw he had hidden his vehicle so as not to be identified. Oct 2014 and the council sent sleazy to tell me “You can’t prove it was a council steel door on your house” when I suggested that “Lancaster City Council” stencilled was a clue. THERE WAS NO LEGAL JURISDICTION FOR GESTAPO OR COUNCIL OR ANYONE AT ALL TO BE ANYWHERE ON MY PROPERTY. And none can be provided. So apologies if my case is complex, if any one agency had done what they were paid by the state to do, it would not have passed the corruption from 2001 to start with and the lunatics would not CONSTANTLY be rewriting what has gone before and using lowlife to pose as me to aid that. Officer TRACEY KENNEDY has been given notice to quit my house again. The Gestapo say house theft, perjury, pose as me in courts, looting and so on are civil matters adding that, “People only come to us because we’re free” (when I asked them what they were doing about MY HOUSE THEFT etc). Carol Woods Ms and anyone could ask me if they fail to grasp any points I make, but no one has. PS, the Gestapo keep thinking of other “reasons” as to why I “lost” my house making it all even more complex. It seems only I can grasp it all. Please feel free to quote me. Dear Sirs The data with photos sent as per below and yet MORE thugs hide AS TOLD WHERE I AM TO PRETEND TO HAVE MET WITH ME IN FRAUD Thus I resend this and add some more of the same frauds as and when they take place. Thursday 19/7/18 and side of Morecambe library hiding in the large shrubs a white shirted overweight male who then tried to reach his car also parked “hidden” to pretend that hehad met with me. On camera, I was faster than he was and thus that was acted out again later using another white shirted overweight male following me which failed to “prove” anything as I walked off elsewhere. Yesteday I did not go out and as usual found the FRAUDS and HARASSMENT thus sent to me in 28 Fell View LA2 9RP WHO GAVE THESE FRAUDSTERS THE INFORMATION THAT I WAS INDOORS AND WHERE? Thus a large black (poss Nissan) mparked outside me just over 2 hours with the driver hiding by lying across the front seats (let’s hope he suffered cramp), he drove off after I took photos throughout the time. Another arrived and did the same but drove off as soon as I took photos, that car has been used previously DV14 RGX, then that was replaced by another, MA07 NHL and that was driven off after the saw me take a photo, and was replaced by yet another, NV04 GVF. And so it went on. This morning, a white shirted male hid his car behind 31 Fell View which is used by fraudsters and has been from Mach 2014 when I moved to rent 28. He then went to a lowere even number and returned to his car pretendign he had met with “someone” (me), amid others used to DEFRAUD me, he had the usual old doxy in his passenger sat who I caught on camera. Soon after that, ANOTHER white shirted male drove his large black Nissan from behind 31 and that I was sure was the one from outside me yesterday. We had ANOTHER “met with ” FRAUD. Heaven help those cheated out of all sorts as they do not know what goes on using lowlife as I have discovered. Subject: Police, HOUSE THEFT, FRAUD and estate agent involved. This is to estate agents J D GALLACHER of Market St Lancaster. From Ms Carol Woods sorry I have no phone. To interested parties also. FARRELL HEYWORTH is ANOTHER CORRUPT agent who I will deal with when they start to pretend again. Earlier today, the usual FRAUDSTER pretended to have met with me just because he was parked near to my car; the ILLEGAL GPS on my car allows for this. The Gestapo assumed I had returned to my car to drive off when I returned to move it to another parking space. In that, the fraudster sat to pretend was not alone, hiding at the rear of flats used OFTEN by fraudsters, thieves, liars and RE-CRIMINALS such as WOODRUFF 2 Fell View LA2 9RP was JDG car and he raced off as he assumed I had driven off and would not see the usual thuggery in BEHIND MY BACK FRAUD. 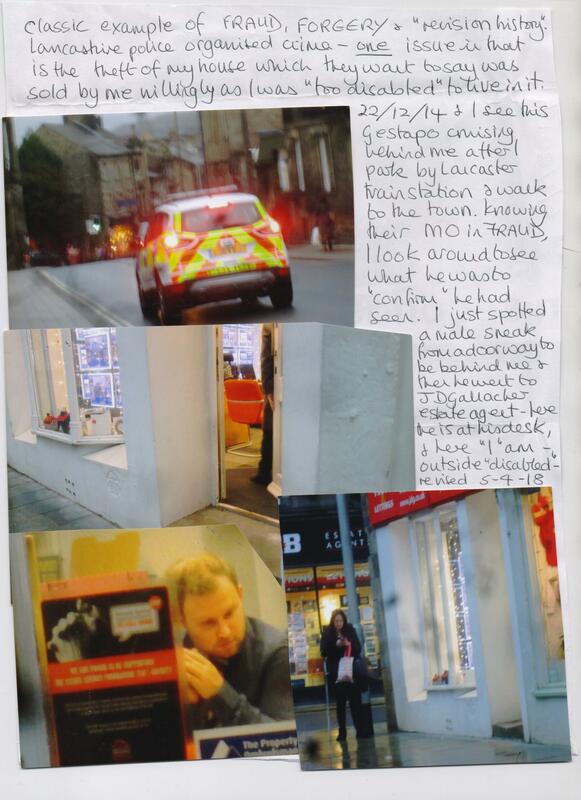 I attach the photos of 22 Dec 2014 when one of their staff did hide in a doorway as I had parked that side of Lancaster then and he to then creep out as I passed and sneak along behind me to pretend he was with me ABOUT THE SALE OF MY HOUSE WHICH WAS STOLEN WRECKED AND LOOTED IN OCT AND NOV 08. The Gestapo alerted me to that fraudster from JDG on 22 12 14 as he was cruising slowly along as usual to “confirm” he sees whatever his delusions allow which was that he saw him from JDG and saw me thus 2 + 2 = 5 as ever. 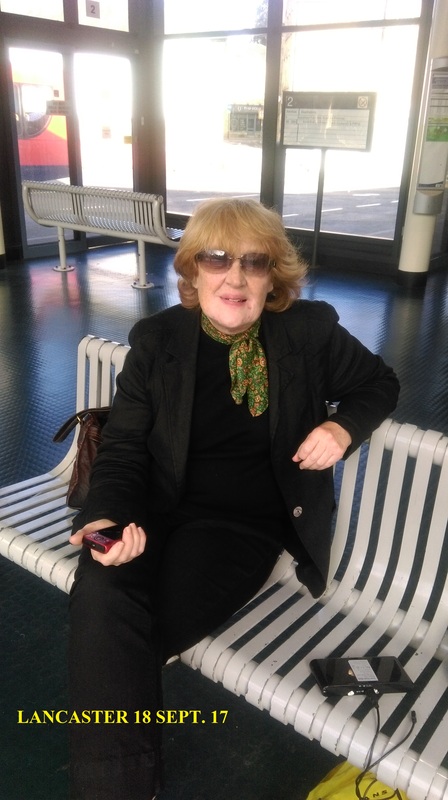 L Curwen “disappeared” while MR MAURICE CURWEN had £50.000.00 (50K) of MY money from a court award which they claimed was HER money after an RTA when it was MINE for INDUSTRIAL INJURIES. It is laughable to think that any scum who claims to be me had industrial injury when they wouldn’t know a day’s work if it hit them in the face. Mr M CURWEN continues to pretend by stalking that he is married to me!! She lives in a second address they have. The tax payer funds that. They claim that I had an RTA as her for the money. I have never had an RTA. Nor have they. May 2014 and I filmed Mrs Curwen and his sister hopping about on borrowed crutches to pretend that they had had an RTA and were “disabled” as the deranged they are BUT IT WORKED FOR THEM. Thus outside J D Gallacher the woman with crutches and her phone was to be me as Mrs L CURWEN SEEN there as if that PROVED I asked them to sell MY house STOLEN in 2008. In 2009 J D GALLACHER KNEW of the events at MY HOUSE as they had dealt with the sale of 29 Blades St Lancaster for police officer TRACEY KENNEDY and ANNA J PERELES (both of whom also have claimed to be me IN COURTS and so on) which was sold as they pretended to be buying my house which was not bought as it was not sold. J D GALLACHER told me that they were surprised that Pereles used one solicitor for sale of 29 Blades St (where KENNEDY had lived in hiding for over 2 years as owing monies to courts and debt agencies etc and I have recently asked the Home Office if they paid her the wages of police while she lived in hiding. I have also asked how she could be Green party councillor while police as police are non-political. There is more out of scope here) but not the same to “buy” my house which the sale of her slum could not have bought anyway as that solicitor was BOGUS and used by the lunatic in residence of Lancashire County Council also legal rep for the Gestapo IAN YOUNG, on papers sleazy receptionist sent to YOUNG to then send to me to make me think the solicitor dealt with things. I met the solicitor twice and she knew nothing at all about my house or any matter related; she did not know that her clerk PAMELA KERR was impersonated by Gestapo mutton dressed as lamb, harridan and halfwit DS DENT of MORPETH police. I know and it is all proven. Thus J D Gallacher now recruited to the masonic cause of thuggery and revision history again pretended to be involved with a sleazy also parked hiding in a “met with” fraud. I also attach some photos of others, old doxies, who ALL claim to have met with me when they have not.I got his photo as well. The use of sleazy from J D Gallacher included more recently EXACTLY the same hiding to then sneak along behind me to dodge into the office and PRETEND (also caught out) which was a female, she probably wanted a pat on the back as a “good girl, well done”. THIS IS MY CEASE AND DESIST TO J D GALLACHER, YOU HARASS AND INTEND TO DEFRAUD, FORGE AND COMMIT SERIOUS CRIME and if you think it is going to be swept under the carpet or “forgotten” I suggest you think again. UNDER NO CIRCUMSTANCES WOULD I ASK YOU TO DEAL WITH ANY MATTER FOR ME. Carol Woods Ms I hope that is clear. to privateoffice, policing.minis., sajid.javid.mp, homeaffcom, farront, look.north, david.gauke.mp, hammondp, johnsonb, john.humphrys, donald.toon, me, bae146, cat_smith, ministers, bob.gallacher, lep.newsdesk, ben.wallace.mp, coopery, bennh, bluntc, lancashire, telegraphedito. 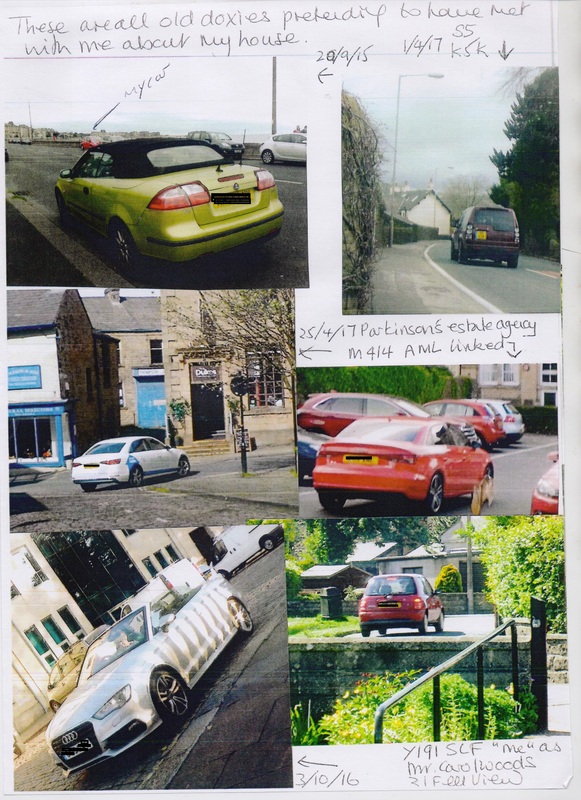 The Y reg cars and their significance IN SERIOUS CRIME LANCS. This has been an issue from 2013 especially and much is involved with this LOOTING OF THE DEAD A PART. I am Carol Woods Ms and sorry I have no phone. I am sending the details again after the lunatics again today pretend that I Ms Carol Woods am not me and have just moved yet again to 28 Fell View LA2 9RP and really, they also try to pretend that Fell View is miles away as Penhale Gardens LA3 2QA again in what is known as “brainwashing”. 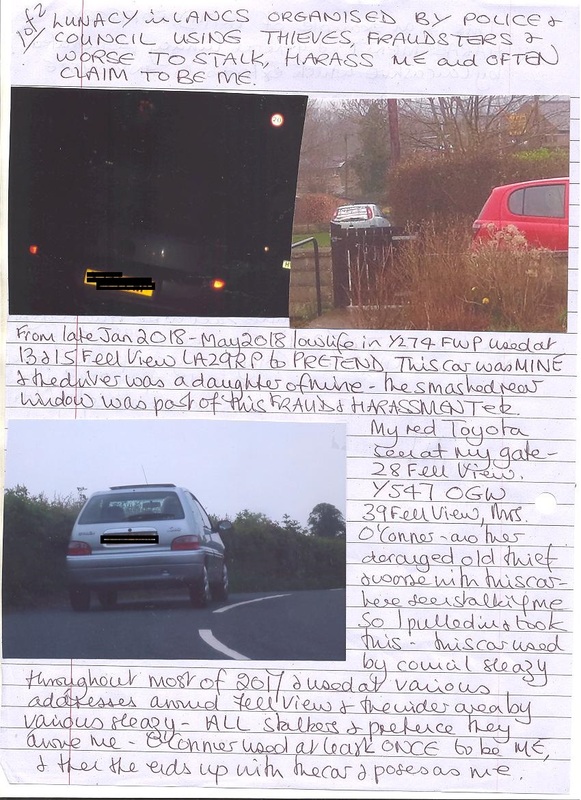 The car Y274 FWP and the roughneck user at 13 and 15 Fell View from Jan 2018 with the Gestapo trying to make her into me as she had NO INSURANCE (and probably no licence) is seen again. She could not have the window repair as she was not insured. Without going into all that again and the thuggery PLANNED for my holiday away June to July this year using Jet Parks 3 at Manchester Airport yet again which all failed, I found again that O’Conner from 39 Fell View, she of the various addresses where she claims to be me in at least one of them, Y547 OGW and to be “confused” with Y274 FWP. Thus either one is me! My red car seen at my gate is X165 YUB so I can’t see any confusion. Y274 FWP is a small Vauxhall. Here I took this as O’Conner being unemployed like MANY, ALL AT ONCE can wait by her car and race off behind me when I go out in my car and they pretend thus that they are me using their cars. (RX02 TLU another used from 14 in same fraud for example.) I had seen O’Conner driving behind me and pulled in; she had to pass so I took this. This car was not hers in 2017 but was used by VARIOUS council sleazy at various addresses where they, stalking me pretended they drove me and dropped me off. Then one started to drive about O’Conner (despite her 4 other cars) and they both then pretended she was me driven about. O’Conner then ends up with the car this year from end of 2017. 3 other of her cars have “disappeared” with at least one going to council sleazy. On 16/7/18 O’Conner left her car at 5 Fell View which I took a photo of wondering why there as 39 is nowhere near 5 given the lay out of Fell View. Then today, AALTO driving tutor drove round slowly at least twice; then I knew that YK02 VPF is STILL THE ISSUE and my finding out what was going on in Lancashire. This car was LOOTED from a lady with her assets looted after she was bullied to death in Flat 3 Penhale Gardens which I found out about when I rented there from 1/7/13 to 24/3/14. In that I found that an old parasite, who was nothing like me, in Flat 5 had been given a provisional licence by the Gestapo AS IF SHE WAS ME LEARNING TO DRIVE. AALTO was one driving instructor used from 5 she had. Without going into all that (but anyone can ask), the INTENTION has since to make me a driver WITHOUT INSURANCE and in any Y reg car using lowlife to make that seem fact. The use of a partially retired old woman in 4 Quernmore Rd near Fell View when she stalks to pretend I take a lesson in M60 ESB is also well photographed. Thus I was to see Y547 OGW at 5 Fell View and think it was YK02 VPF at 5 Penhale Gardens and that NOW was then in the usual lunacy. Sending AALTO round (he now has a different car for L drivers so I have both of the ones he has used from 2013) was to make me think even more that I was the LOOTER and THIEF from Flat 5 and only learned NOW to drive. Thus I have just moved again and as I moved to Flat 3 on 1/7/13 then I appear to have just moved to 28 Fell View which seems to be Flat 3 miles away and 2018 is actually 2013!!! I told you I couldn’t make this up. Yesterday the council thugs started early: the wagon arrived to park outside me in 28 where he just sat; he was rewriting these council thugs from 2/11/17 with WINDOWS to be MY HOUSE and Oct into Nov 2008 and thus I had just moved then as well. He did not have windows on the wagon yesterday as if this is July 2013 then Flat 3 had no windows ripped out to replace them. Thus windows were not required. And I will move again (according to them) on 24th of this month to be 24/3/14 when I moved to 28. Ends Mrs MARGARET PORTER was not known to me at all; YK02 VPF was her car. Carol Woods Ms. I am Carol Woods Ms 28 Fell View LA2 9RP sorry I have no phone. The first photo attached is SUZANNE and ANDREW JARVIS of 41 Fell View LA2 9RP where I rent 28 BUT this photo of end March 2014 was because I found that they pretended I lived with them being cared for and driven about by them. They started as I unloaded my car when moving into 28 Fell View on 24/3/14. Jarvis was told what to say to me which was trying to make MY experiences of photos LOOTED FROM MY HOUSE on 19 Nov 08 into her experiences and for which I knew she was a liar immediately: nothing she said could not be checked and check I did as I always do. It took me a month to find out what her part was in all this. Moving into 28 I, as always, was nothing but pleasant, friendly and helpful when necessary and they took that to be proof I was an idiot and would be easy to DEFRAUD, BULLY and INTIMIDATE not to mention POSE AS etc. That has happened at every place I have moved to since my house was stolen, wrecked and looted in Oct and Nov 2008. Jarvis continues to be used. 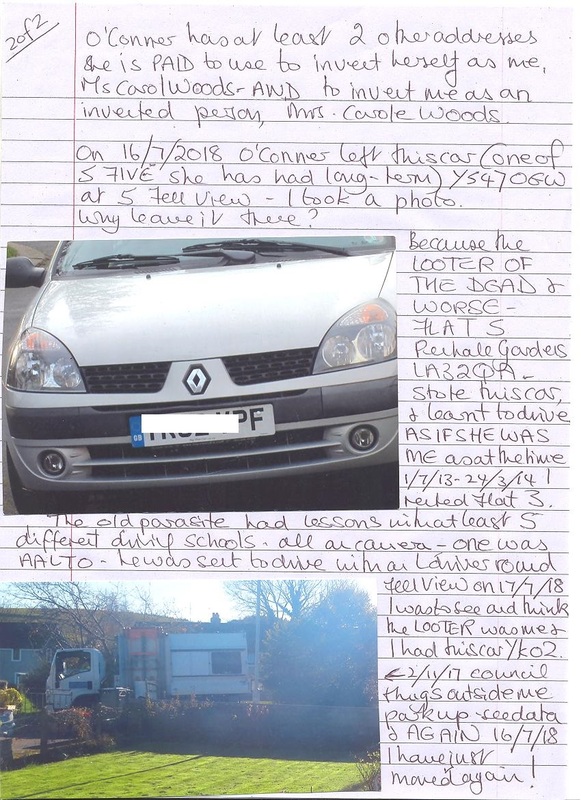 On 24/4/14 yet another sleazy from the council called and as I had had a day out in another tourist town, they pretended I had just moved to 41 again thus PE08 ZRX car overseeing the first fraud and forgery obviously, then PE56 NXB arrived and they did the same again. All that is on record but here I just add PERJURY of JARVIS and others which PERJURY resulted in arrest of me 7 Nov 2015 and 4 months ILLEGALLY DETAINED and now the Gestapo use the lowlife round Fell View trying to [provoke me so they can say I commit the offences WHICH THEY FABRICATED IN NOV 2015. Thus one was “following someone to Kendal” unnamed person, no date given, no proof and no proof the “victim” had even been to Kendal at all. That person I “followed” was JARVIS the PERJURER and more perjury on other “crimes”. There is still no date or proof I ever followed her anywhere BUT my proof is that she FOLLOWS ME and often it was to claim she was me. Found out as they all were end Feb 2015 and SOME decided that they were actually me and Mrs S. JARVIS took a cleaning job as if she was me using her car GN07 AHO. I attach the DVLA doc that shows GN07 was never registered to me. I cover up some detail so the Gestapo cannot use my documents and claim they are someone else’s when they print them off. Naturally, anyone who is me will have the original. The photo of Jarvis is out of date as they both have not aged well and her grey hair is not dyed as yellow as often now; his hair has gone. Apparently I STILL live in 41. The photo of her car was taken 13/4/15 was just as she claimed to be me and I was in Morecambe on the prom returning to my parked car. The ILLEGAL GPS allows for ALL this: the Gestapo cruised by just as I reached my car and he was to confirm what? He saw GN07 AHO parked right opposite mine thus somehow that was PROOF she was me. I took photos; she is lying across the front seats hiding pretending not to be there as she is me SEEN BY GESTAPO near her car! My car is RED and invisible- apparently. Jarvis OFTEN posts as if she is me writing out to someone. The lunacy in reversing FACT to make FICTION and Jarvis has tried to hide in her car at 41 and then race off ahead of me when I go my car just so she can scream I am following her. Sunday, after the failed attempts of 14th to lead to arrest of 15th to be 15 Nov 2010 (yet another arrest for nothing which the Gestapo want to make into something NOW) I wondered why Jarvis had not gone to church (“I’m a Christian, I couldn’t even tell a white lie” she told me some while ago) and then I found out; to be MY FOLLOWING HER as “crime”, they waited and watched; each time I went to my front garden they assumed I was going out and raced to get GN07 AHO drive from 41 and waiting end Fell View so they could wait for me to follow them! (This is done OFTEN, and not always Jarvis, the Gestapo are desperate to create a crime for me of following which is the Masonic inversion lunacy as ever). When I did not go out, they drove back and waited some more. That went on to 8pm when they realised I was only going into my garden to water or weed etc. Thus the Gestapo had no arrest to conduct on 16th which is YET ANOTHER DATE they are desperate to “rewrite” from Feb 2004. I have good reason to think that she went to post as me again this morning. AND as I parked in Lancaster today, YET AGAIN the Gestapo had ANOTHER local roughneck hiding to then rush into the town and pretend she had just parked my car and she was to be JOANNE HALL who lives in Oldham but is said to be me. J Hall has long dark hair; we have DOZENS used to be her as me so I attach some photos of lookalikes of J Hall who happens to be almost 20 years my junior! They are all J Hall and all thus me; all of them. Ends Carol Woods Ms I have not developed to scan the photos of the roughneck found hiding today.